The active version of TraxInterface3 can drive up to 300 remote peripherals. The passive version can be used to interface standard peripherals (not equipped with TraxBus). 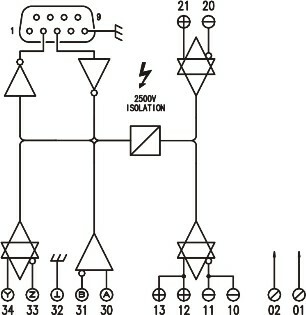 A complete galvanic isolation is provided between fieldbus and local interface. A single master controller is connected to SubD 9 female socket. 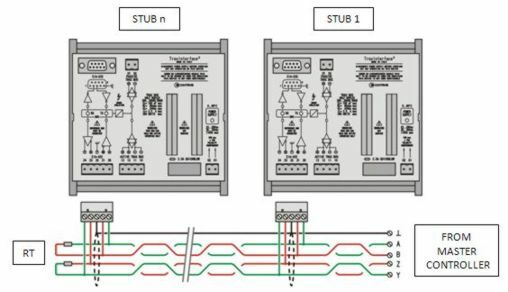 Is the easiest way to implement TraxBus when the number of remote peripherals and the system architecture doesn't require more than 1 TraxBus line. 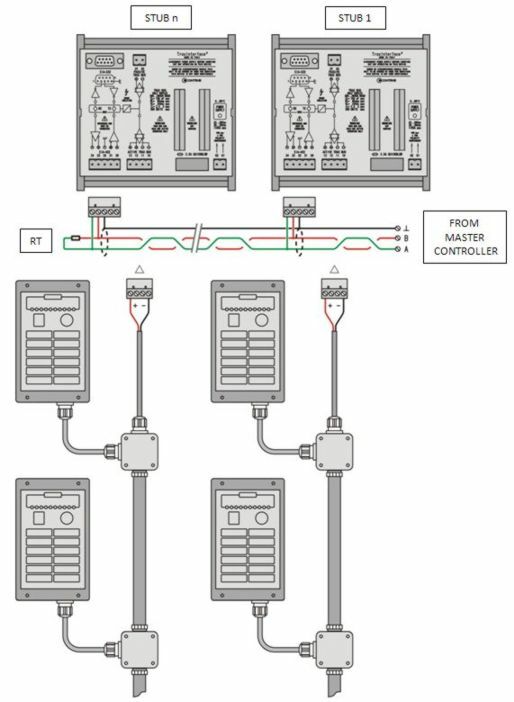 A single master controller is connected to SubD 9 female socket: only RxD, TxD and GND are required. 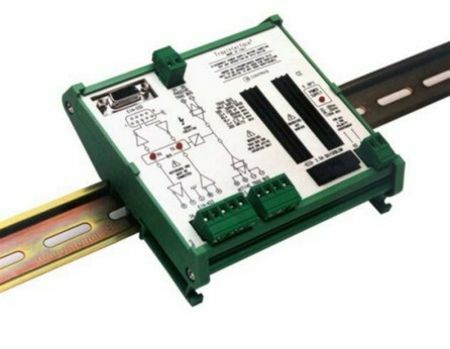 EIA-RS485 interface can be used to drive one or more TraxBus lines. Communication line coming from the master must be wired at terminals 33 and 34, signal ground and shield to terminal 32, leaving terminals 30 and 31 unconnected. 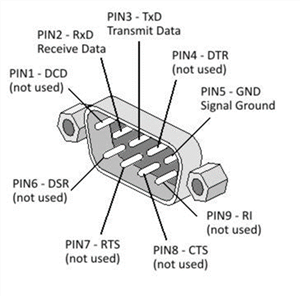 At higher baud rates and long distance could be necessary to install termination resistors (RT, typically 120 Ω) at both ends. Since TraxInterface3 is provided with high value fail safe resistors (10 kΩ), additional biasing could be required. 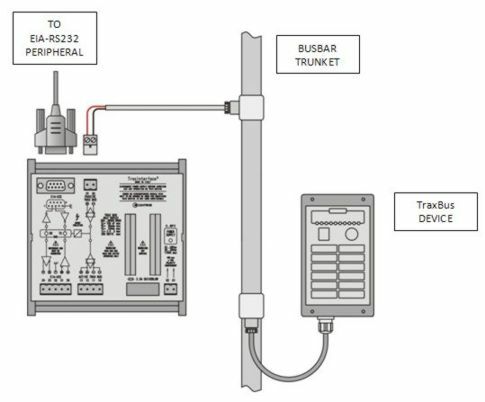 EIA-RS422 is a Full Duplex interface, TraxBus handles Half Duplex only, thus there is no practical reason to adopt such interface that requires additional wires. 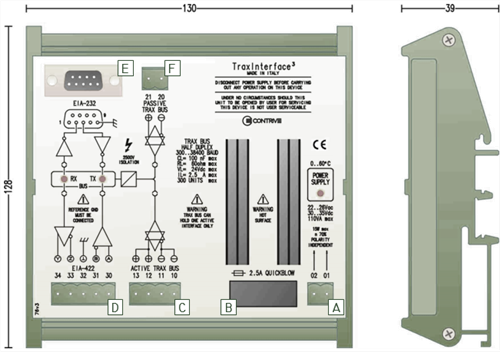 TraxInterface3 can handle multiple receivers/transmitters in a multidrop configuration, following the same rules as EIA-RS485. Thirds party products can be connected to TraxBus by means of PASSIVE version of TraxInterface3. Depending on selected interface, the local peripheral can use EIA-RS232 (example below), EIA-RS422 or EIA-RS485. From local interface it will be possible to read all the network data traffic. 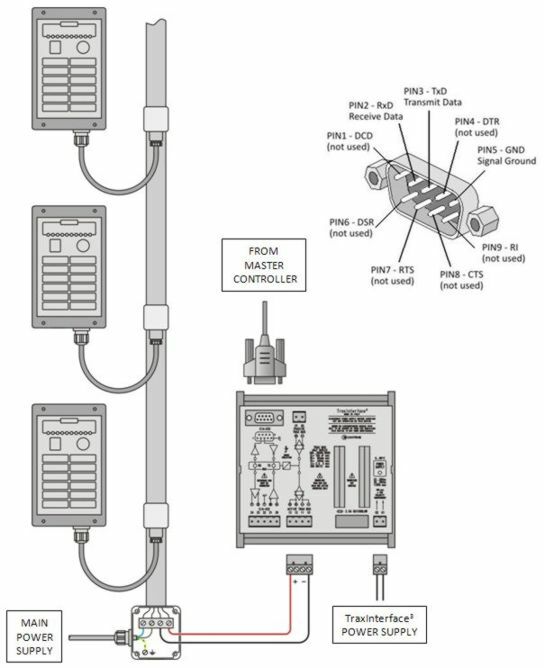 Specific peripheral must be programmed to handle the communication and transmit on the network only when is required, to prevent data collision.